Bring your gin and tonic to a molecular level with this chemist's kit for modern mixology. Did you ever think you'd have your eureka moment with a gin and tonic in hand? 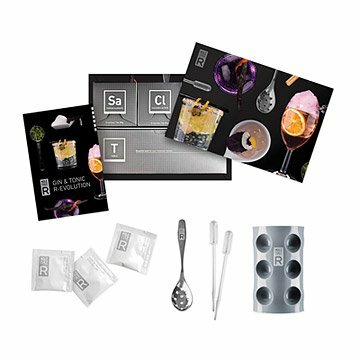 This molecular gastronomy kit is specially tailored to make unique concoctions based on the classic mixed drink. Experiment with cinchona bark - the original source of quinine - and natural food additives to spruce up each refreshing drink with colorful foam or beaded tonic. Your impressed party guests will applaud your latest discovery in modern mixology. Instructional booklet, 2 pipettes, a slotted spoon, and a silicon mold included. Materials from Canada and China. Assembled in Canada. Neat product for anybody who likes to drink & experiment with new drink ideas! My friend is a science teacher so he especially loved it. I got this as a gift from my brother and busted it out as soon as I could, which was at an all-girls night I was hosting... BOY did we have fun! The kit looks super sleek and modern, the recipes are easy to follow and the results were quite tasty! We're already excited to try more!